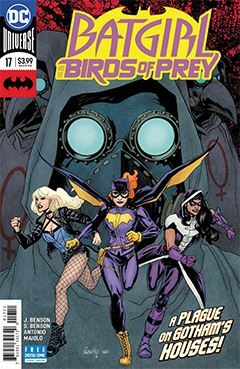 A terrorist group known as the Daughters of Gotham have infected men of Gotham City with a debilitating disease. Batgirl, Harley Quinn and Batwoman have been taken hostage in the hope of being recruited to the cause. Poison Ivy is attempting to create a vaccine, while Amanda Waller is chomping at the bit to run the terrorists to ground, hostages or no. At the root of it all is a centenarian known as Patient Zero. She sees men as the cause of society’s ills, and is determined to wipe them out, beginning with Gotham City. Too many victimized women are happy to rally to her cause, regardless of the consequences. Fortunately, the Birds of Prey have help – a LOT of help. Thankfully, the overall story is not absurdly long. Julie Benson and Shawna Benson have presented a narrative without a ridiculous amount of padding. It’s tight and well-crafted, and I appreciate that. Roge Antonio’s artwork is solid, the guest characters are an added bonus, and overall it was a pleasant read.